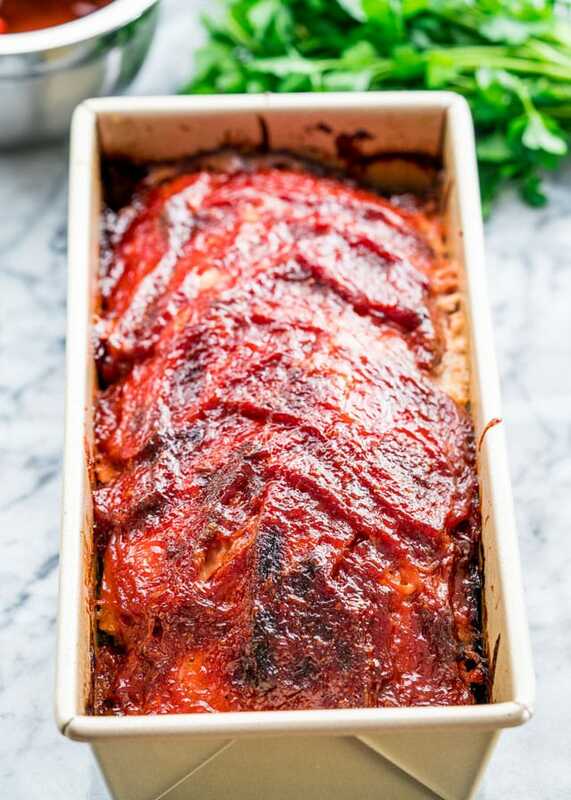 This easy Bacon Wrapped Meatloaf recipe will become a family favorite for sure! Meatloaf is back and better than ever, full of flavor, some hidden veggies, and wrapped with delicious thick cut bacon! Is meatloaf still a thing? I mean do people still make a good hearty meatloaf and mashed potatoes for dinner? I sure hope so, because comfort food doesn’t get any better than this. 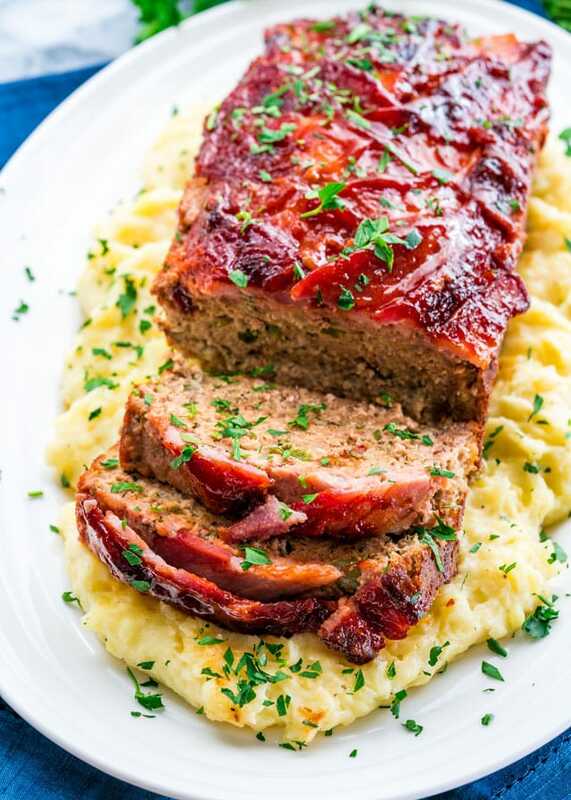 This bacon wrapped meatloaf will surely please and impress your entire family. Not to mention how easy it really is to make meatloaf and pretty cheap too. The great thing about meatloaf is that you can hide veggies in there and nobody would really know. I added onions and peppers to this meatloaf but in the past I’ve even added mushrooms and it was SO good. It makes it extra moist so you don’t end up with a dry meatloaf, especially if you’re using leaner meats. If you need to make this recipe gluten-free, you can absolutely use gluten-free breadcrumbs. I’ve found them at my local grocery store and they’re almost identical to regular breadcrumbs. Of course, you can use store-bought BBQ sauce to speed the whole process up. If you want to make your own, but want it alcohol-free, you can leave out the bourbon. Any type of meat would work here. I chose pork because it has a good fat content which makes for a nice and juicy meatloaf. But ground beef would work just as well, or you could even mix the two. If you want a healthier meatloaf, then you can use ground chicken or ground turkey. Since chicken and turkey are much more leaner that beef and pork, your meatloaf may end up a bit drier. You can mix the chicken/turkey with pork or beef, or you can top each piece with a bit extra sauce. I’d still wrap it with the bacon, because everything is better with bacon. You can really load this recipe up with veggies to make it healthier! Do you have some picky eaters at home? They’ll never know what you have hidden in this meatloaf. What an awesome trick to hide up your sleeve, hey? Adding veggies to your meatloaf helps keep lots of moisture in there as well. It’s a win-win! I like to either grate or mince my veggies nice and small. You seriously won’t even know they’re in there other than a few pops of color! Preheat your oven to 350F and spray your loaf pan with cooking spray. Mix all the meatloaf ingredients, other than the bacon, well in a large bowl. I usually use my clean hands to do this part! It’s messy but it makes the job a lot easier. You can use a spoon to mix everything together if that’s what you prefer. Scoop the meat into the prepared loaf pan and smooth out the top. You can create a dome if you’d like for a more loaf-like shape as well. Cover the top with slices of bacon and tuck the ends down the side of the meatloaf. Whisk the sauce ingredients together in a small bowl and either brush or spoon half the sauce over the top of the meatloaf. Let everything cook together for 1.5 hours, then brush or spoon the remaining sauce over the top of the meatloaf and bake until the meatloaf is fully cooked through. Let it rest for at least 10 minutes before serving, then cut with a serrated knife. 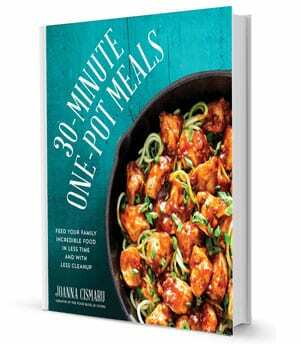 You can also prep this whole recipe, store it in your fridge up to 3 days, and toss it in the oven when you need it. The best way to tell when your meatloaf is done cooking is by using an instant read thermometer; it should read 160F. 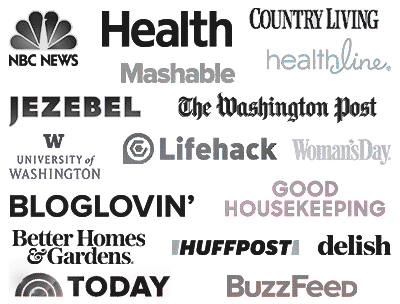 They seriously make such a difference in the kitchen! No more guess work, and perfect meat every single time. 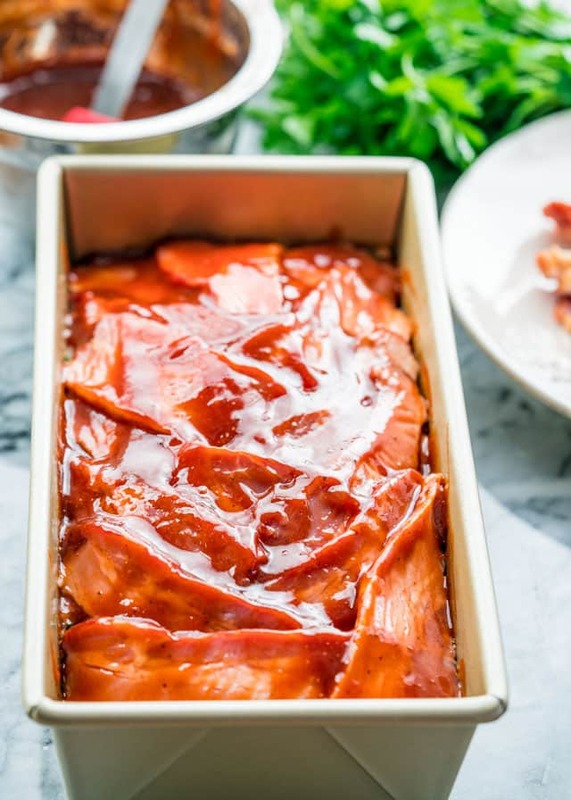 If your meatloaf is fully cooked after the 1.5 hours, you can give it a quick broil with the remaining sauce so that it will caramelize without the meatloaf drying out. This usually happens when your meatloaf is too dry, but can also happen when there is too much liquid. Using breadcrumbs is a great way to keep a perfect balance of moisture in your meatloaf. Eggs also act as a binder in this recipe. Those are two ingredients I wouldn’t try to use less of, or leave out entirely. I love to serve this meatloaf over some mashed potatoes, or a side of steamed veggies. Try out these other sides as well! You can keep it right in the loaf pan wrapped up with plastic wrap or foil. You can also keep in an airtight container. It will last 3-4 days in the fridge. Yes! Meatloaf is a great dinner to freeze. You can freeze it before or after cooking. To freeze it before cooking, place the meatloaf in a loaf pan and wrap it tightly with plastic wrap, then in foil and freeze. Thaw it out in the refrigerator for about 18 hours before baking it. To freeze it after cooking, make sure it’s fully cooled before putting it in the freezer. You can either freeze it in individual slices, wrapped up tightly with plastic wrap or foil, or you can wrap up the whole loaf. Place the wrapped up slices or loaf into a large freezer bag and freeze up to 3 months. If you’re freezing individual slices, you can reheat them in the microwave. Otherwise, I like to place the frozen loaf on a baking sheet lined with aluminum foil or parchment paper in the oven at 350 F degrees until heated through. Prepare oven and loaf pan: Preheat your oven to 350 F degrees. Spray a loaf pan with cooking spray and set aside. Combine meatloaf ingredients: In a large bowl, add all the ingredients for the meatloaf together (except the bacon) and mix well with your hands. You can also saute the chopped onion and pepper first to soften it a bit, but it's not necessary. 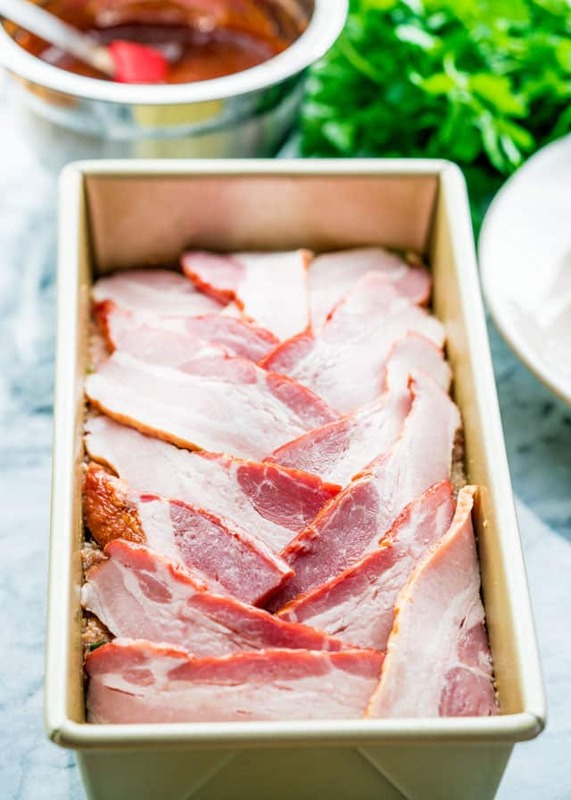 Transfer meatloaf to loaf pan and cover with bacon: Place the meat mixture in the prepared loaf pan and smooth out the top with a spatula. Cover with bacon slices, tucking in the bacon over the sides. Make sauce and brush over meatloaf: In a small bowl whisk all the sauce ingredients together. Brush half the sauce over the meatloaf. Bake: Transfer the meatloaf to the oven and bake in the oven for 1 hour and 30 minutes. Half way through, take the meatloaf out and brush the remaining sauce over it and continue baking. Cool: Let cool for about 10 minutes then cut into slices and serve over mashed potatoes. You can make this pork-free by using 2 lbs of ground beef, chicken, or turkey, and turkey bacon on the outside. 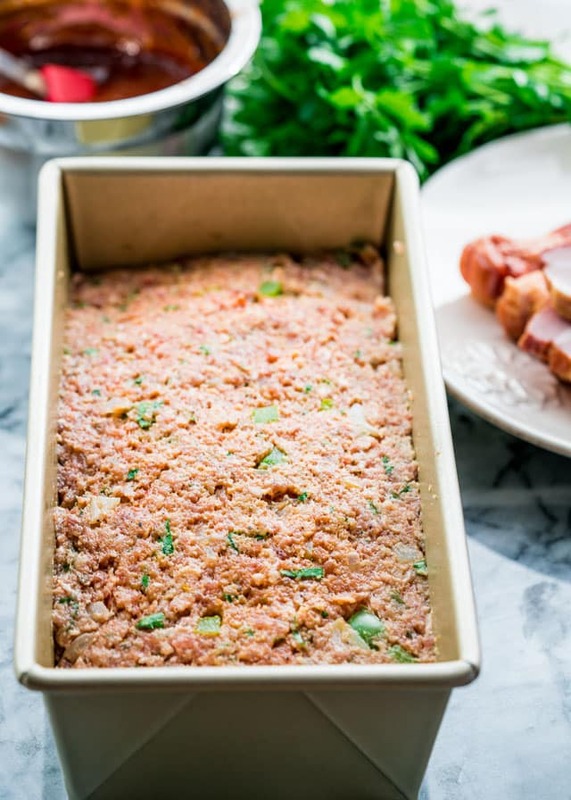 Add any veggies you'd like to load up this meatloaf and clear out your fridge. Mushrooms work fantastic in a recipe like this, as they keep the meatloaf nice and juicy. Bourbon can be replaced with any type of whiskey, rum, or brandy. Use 1 tsp of vanilla extract if you'd like a non-alcoholic substitute. To make this gluten free, use 1/3 cup of potato starch, also called potato flour, in place of the breadcrumbs. If you want to use a pre-made BBQ sauce to speed up the process, that is okay. Recipe originally shared May 2011. Oh my this was so good. The meatloaf was moist and the sauce was finger-licking good. Possibly the best meatloaf recipe I’ve ever made. Only change I made was using grass-fed ground beef instead of ground pork. Do we cover the meatloaf at all? Nope, I did not cover it at all! This looks like another great recipe Jo. Only thing I could think of that I might change is laying the full strips of bacon in the pan, and leave the excess out before I put the meat in it, then overlay the excess bacon on top of the meatloaf. That only means more bacon per slice, and who doesn’t want more bacon, right? Thanks for sharing. You’re right, the more bacon the better! This was a big hit with the meat eaters in our family tonight. The only divergence from your recipe was that I used almond milk, as we have a lactose intolerant family member. It made way too much to fit into even my largest loaf pan, so next time I will use less meat. Thanks for a great recipe! Another winner Jo!! Made this for dinner tonight, OMG. Why haven’t I put bacon on meatloaf before?? ? Lovely! This looks like such a cozy dinner. I have been craving meatloaf lately, but I always revert to the old Lipton recipe. Yours looks to die for! Honestly I wanted to reach through the screen and grab a slice of this meatloaf – LOVE the bacon wrap! 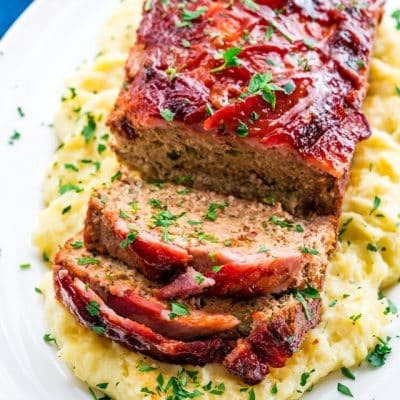 This ALL PORK meatloaf WITH BACON too looks delicious, Jo and I can’t wait to try it. I have done a bacon topping by weaving the bacon as you do for a lattice pie crust so may use that technique on this one. Yum!